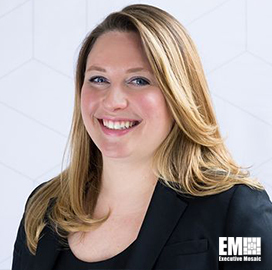 Jackie Fendrock, who joined ECS in 2011, has been promoted to vice president of business development and operations at the Fairfax, Va.-based information technology services provider. She will be responsible for aligning ECS’ strategy with government market opportunities as well as manage its customer, partner and industry relationships, the company said Wednesday. “Our approach to business is about teamwork and client relationships, and Jackie fully represents those principles,” said George Wilson, president at ECS. Fendrock previously served as director for business development and operations and before that she was federal civilian account executive of the company. Her career also includes time at Lockheed Martin (NYSE: LMT) and Computer Sciences Corp.